Underline the way you live through Ornamental Mouldings! Ornamental mouldings are highly distinguished moulding patterns used to enhance the design and style of a room. Whether the design you are looking for is an acanthus leaf, greek key, egg and dart, whatever the period you seek, Adam style, Greek and Colonial Revival style and Art Deco, Victorian, you can find it here! These mouldings are referred to as ornamental mouldings because of their careful attention to detail and meticulous resemblance to the designs and patterns of ancient times. Ornamental mouldings render a distinctive and finishing look to your décor. We carry a full array of stunning and unique ornamental mouldings like ornamental crown moulding, ceiling medallions and ceiling domes, ornamental panel mouldings and ornamental frieze mouldings. 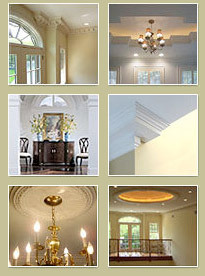 These mouldings are of the highest quality material. We also manufacture and elaborate ornamental medallions and ceiling domes with aesthetically rich designs used in high-end commercial projects like catering halls and ballrooms. These medallion and other mouldings feature exquisitely delicate detail.